With my extensive knowledge of the great battelfields of South Africa, join me on a visit to these now tranquil scenes which were host to the bloody fighting that forged our nation's history. Visit the battlefields of the Great Trek (1834-1840), the sites of the First Boer War (1880-1881) and the Anglo Boer War (1899-1902) - also called the Boer War. These tours are of special interest to the British and Welsh. There are special interest sites from the Anglo Zulu War in 1879, such as the Battles of Isandlwana and Rourke's Drift. 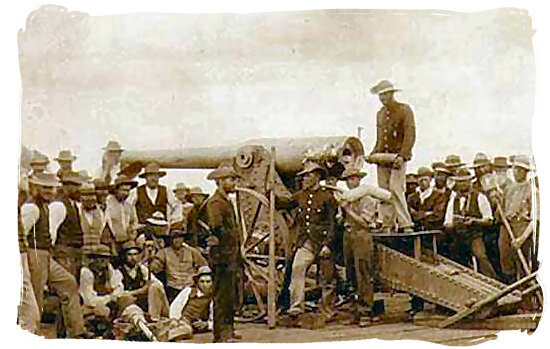 Boers using the Long Tom cannon at the Siege of Mafikeng. Home | Tours | Special Tours | Historical Tours | Testimonials | Contact Me | ©GuidedbyGabriel. CSS by Wink Hosting.